A backyard shed makes a practical addition to any home landscape because it provides a place to store lawn equipment, outdoor furniture and any number of other items out of sight and protected from the elements. Building a shed may seem like a daunting project for first-time builders, but this project can be completed by nearly any determined homeowner as the process is broken down into manageable steps. There are a few things to consider before you begin construction on a backyard shed. Most municipalities require a permit to build a backyard shed, although there is often an exemption for structures under a certain size. 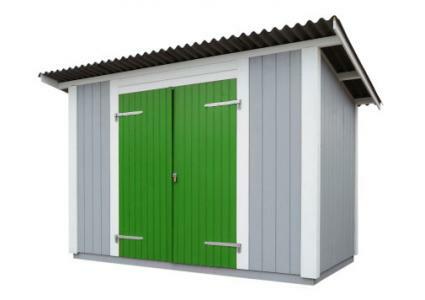 It's always better to check with local authorities when planning your project to eliminate the risk of incurring fines or, even worse, having to disassemble your shed. The back corner of the yard is often the most logical place for a shed, but feel free to put it anywhere that suits the layout of the landscape and has convenient access. If possible, locate the shed in a place where the ground is relatively flat to avoid the added step of excavating a flat building pad. 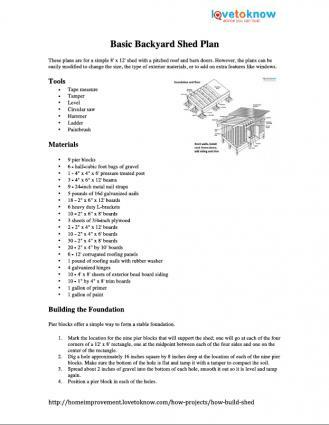 These plans are for a simple 8' x 12' shed with a pitched roof and barn doors. However, the plans can be easily modified to change the size, the type of exterior materials, or to add on extra features like windows. Pier blocks offer a simple way to form a stable foundation. Mark the location for the nine pier blocks that will support the shed; one will go at each of the four corners of a 12' x 8' rectangle, one at the midpoint between each of the four sides and one on the center of the rectangle. Dig a hole approximately 16 inches square by 8 inches deep at the location of each of the nine pier blocks. Make sure the bottom of the hole is flat and tamp it with a tamper to compact the soil. Spread about 2 inches of gravel into the bottom of each hole, smooth it out so it is level and tamp again. Position a pier block in each of the holes. A plywood floor forms the basis of the shed structure. Cut nine 8-inch long pieces of 4" x 4" post and place them into the depression in the top of each pier block as support posts. The soil may then be filled back over the pier blocks. Rest a 2" x 6" x 12' board along each of the outer 4" x 6" beams to serve as rim joists and secure them with a heavy-duty L-bracket at each end and at the mid-point. Nail a 2" x 6" board as a joist between the ends of each rim joist at 16-inch intervals across the length of the floor. Nail plywood into place to create the floor. Frame the walls using 16-inch stud spacing and a 4-foot opening for the door. Nail a 2" x 4" x 12' board as a base plate on what will be the back of the floor. Nail a 2" x 4" x 8 ' board on the left and right sides of the floor to serve as base plates. This covers the three sides of the floor that will be solid walls. On the side with the door, nail a 2" x 4" x 4' base plate onto either side of the door opening. Cut an 11.25 degree angle in one wide end of ten 2" x 4" x 6' boards and eight 2" x 4" x 10' boards; these will be the studs for the front and back walls. Cut the same angle in one thin end of fourteen additional 2" x 4" x 8' boards; these will be the studs for the side walls. Toe nail the studs to the base plates and nail the top plates into place along the angled cuts of each wall. Cut two 2" x 4" boards to 80 inches in length and nail these into place for the door trimmers; cut a 8-foot 2" x 6" x 8' board in half, nail the two pieces together as a header and install it over the door trimmers. Add three cripple studs between the header and the top plate. The 2" x 6" rafters will support any type of roofing material that is desired. Install a 2" x 6" block between the rafters on top of each top plate; cantilever a 2" x 6" block on each of the four corners to support the roof overhang on the long side of the structure. Nail corrugated roofing panels into place across the joists. Build a pair of 24" x 80" door frames with the 2" x 4" boards and attach these to the door trimmers with a pair of galvanized hinges for each. Cut sheets of bead board siding to fit the doors and each of the walls and nail into place. Cut 1" x 4" trim boards to fit each of the corners and around the door opening, and nail them into place. Prime and paint the exterior of the shed as desired. Bolt a heavy duty shed latch onto the doors to provide security. The latch can be secured with a padlock. 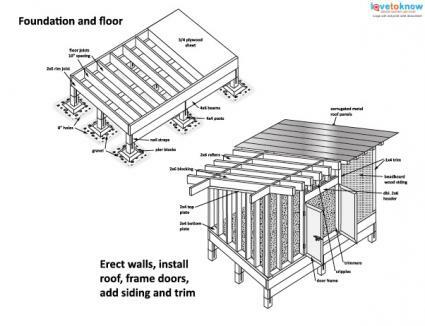 There are numerous ways to customize a basic shed to fit your unique needs. Consider adding a ramp to the entrance so lawn equipment, carts and wheelbarrows can be rolled into the shed with ease. For natural light, frame window openings in the stud walls using the same technique of trimmers, headers and cripples that was used for the door opening. Build custom shelves and tool hooks inside the shed to suit your needs. Use the same type of roofing, siding, trim and paint that your house is constructed with so the shed fits right in. Compared to adding a room to your house, a garden shed is a relatively simple project that adds priceless storage space. It requires a small investment in time and money to build it yourself, but if done well, it will more than pay for itself by increasing the resale value of your home.